I use Windows Live Writer for quite some time to write my post for my WordPress blog. The last version that was published by Microsoft was in the year 2012. So I was very happy when a few days ago the Open Live Writer (OLW) was announced. 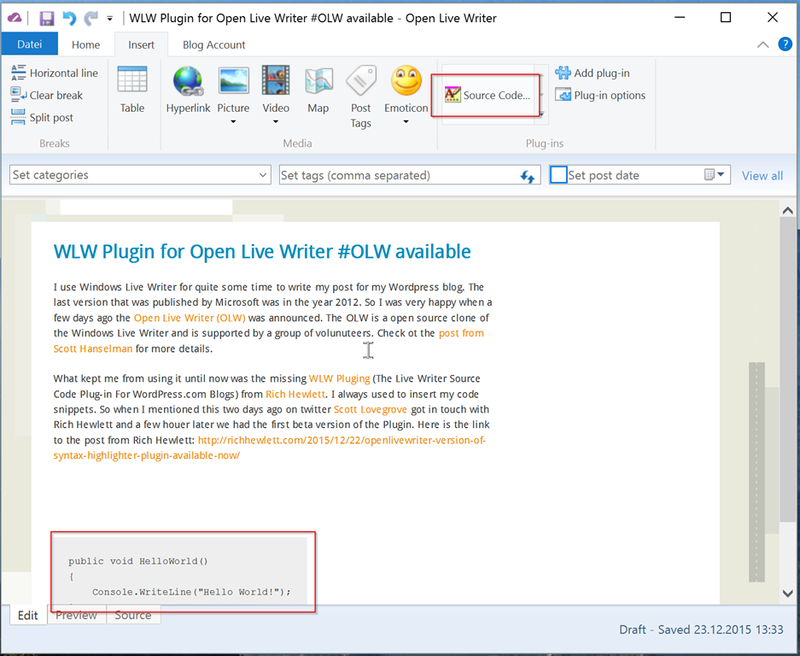 The OLW is an open source clone of the Windows Live Writer and is supported by a group of volunteers. Check out the post from Scott Hanselman for more details. I downloaded the plugin today and installed it without any problems just by copying the files to $($env:LOCALAPPDATA)\OpenLiveWriter\app-0.5.1.3\Plugins and unblocking them. The OLW hast still some minor bugs and is missing spellchecking – but so far it works good and I will use it for all the post from now on. Thanks to Scott Lovegrove and Rich Hewlett for the fast help. And thanks to everyone involved in the OLW project. You did a great job and I hope I can help in the futre. This is the less important plugin for Open Live Writer. There were lots of other useful plugins for WLW that nobody was interested to convert and even Open Live Writer is almost dead. That’s a real pity. WLW is obsolete and plugins as well, but without it I will close my 15+ years old blog for good. It’s a pity. OLW never worked stable with my blog. I now use the web editor.